Pixelache | 1 + 1 = 3? Kiasma seminar room + Stadia // 31 March – 13 April // sign up in advance! 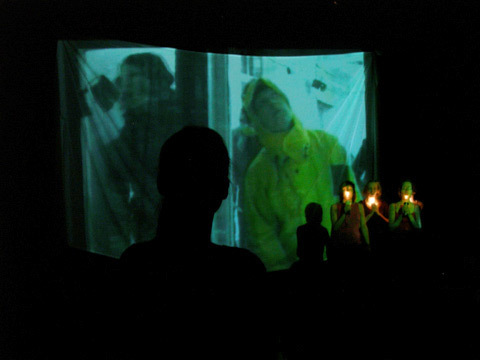 Performing arts and video art meet during a six day long workshop. Video jockeys and theatre makers will get an experience of each other´s working methods. The goal of the workshop is to find new ways to work together and to study communication between a live performer and video screens. Theatrical ideas and video material will be developed in a collaborative performance laboratory. The main idea is learning by doing. The workshop is a collaboration project between Helsinki Polytechnic Stadia, Department of Performing Arts and Pixelache 2006 festival. Workshop tutors are theatre director Riku Saastamoinen and VJ/video artist Jenni Valorinta. Workshop will be held in Finnish, more information below.